In an advisory practice, compliance & paperwork can take a lot of time, effort & money. Also, in advisories, one would have to comply to higher standards due to regulatory requirements. Complying to a higher standard would again mean additional costs as well as rework of the business model. Also, it would involve money and some effort to set it up. But one can derive a competitive advantage of some of the features which are seen as onerous. Like Fiduciary standard. Background – Even in these days of hyper competition & ultra social media activity, Caveat Emptor – or Buyer beware, is the reigning sentiment. Things have become significantly better than, say, a decade ago. But still, the onus is on the buyer to keep his eyes peeled open and ensure that they do not get a raw deal. Customer friendliness has increased for sure, but still there is the lingering suspicion of whether one is getting a good deal. The trust factor still is an area which needs working on, in many business situations. In financial services, where we deal with the wealth of clients, the trust factor is of paramount importance. Trust can be based on personal experience or a referral. But actual experience over time is what will expose the integrity & trust worthiness of a person. There is a problem here. This deduction has to be done based on specific experiences & recommendations of other people. But, this does not preclude a person not acting in the client’s best interests & the clients not even knowing about it. What is needed is a mechanism whereby the client would know beyond reasonable doubt that someone is acting in their best interests. A measure of Integrity – By adhering to the Fiduciary standard, an advisor can unequivocally confirm that their interests lie only with their client. In a Fiduciary relationship, the advisor is expected to put the client interests ahead of any other interests, including their own. This is very significant for a client.. When a person is adhering to the Fiduciary standard, it is an assurance that what they suggest is only in their best interests. 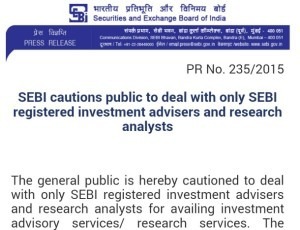 The Investment Adviser ( IA ) Regulations which SEBI has come up with, prescribes that the advisor registered under it ( Registered Investment Adviser or RIA ) has to be fee-only and earn their income only from the client, be a Fiduciary & disclose to the client any potential conflicts of interest. It also prescribes minimum standards of Education, Experience & Certification, appropriate disclosures, maintenance of records & yearly process audits, among other things. Finding a true champion – For a consumer, what is truly enticing is the concept of a Fiduciary. They have always been taken advantage of, especially when it comes to finance. It comes as a breath of fresh air that they can actually find someone who would tirelessly espouse their cause and work in their best interests. People have been searching for such a person for long and have been sorely disappointed that there were none before. A Fiduciary is hence a welcome change for the consumer. Deriving a competitive advantage – Fiduciary responsibility is a game changer as much for the client, as it is for the advisor. The client is infinitely pleased to have at last found someone they can put their faith on & take their counsel. For the first time, they have found someone outside of their home, who truly thinks about their welfare. It is a bonus that the advisor has the knowledge & experience in the domain, provides advice in a non-involved and dispassionate manner & suggests best fit solutions after taking into account the specific client situation. For the advisor, the Fiduciary tag is liberating. Since they do not represent anyone, they are not subjected to the tugs & shoves of a Principal. They don’t represent any Principal as an advisor. They are not bound by any targets & pressure to push products to investors. The advisor can now truthfully represent the client in their best interests, be answerable to them & get paid only by them. When one is a Fiduciary, one can act with complete integrity. An advisor can be fully ethical & honest when operating in a fiduciary capacity. There is no need to stretch facts or misrepresent any products or hype their virtues. The focus is no longer on sales or finding the next client to sell something. The focus is now on the well being of the client, who is now under the advisor’s care. As a Fiduciary, one feels enormous responsibility for the client & true ownership for the client’s success. It’s meaningful work that is enormously satisfying. This does not even seem like work any longer as the advisor loves doing it – and gets paid for it! Our own experience is that clients are looking for true advisors. They search and reach our doors instead of the regular method of going and convincing clients to do business with us! The trust of the client is total and child like. The Advisor becomes a part of the core success team of the client. We need not acquire clients; they seek us out. Surprisingly & paradoxically, inspite of the enormous weight of responsibility on a fiduciary, it makes their life easy. They can act with integrity, which ideally every human would like to. They don’t have to acquire clients; clients seek them out! They have clients for life, whom they offer counsel & lead them on to financially sorted & fulfilling lives. They grow with their clients, participating in their successes and supporting them in their times of need.